Home Off Beat	3D Wooden Sphere Puzzle – Rubik's Cousin! 3D Wooden Sphere Puzzle – Rubik's Cousin! For the ones who have mastered the art of putting the same colors together on the Rubik’s cube would be happy to know that we have just raised the bar a little. 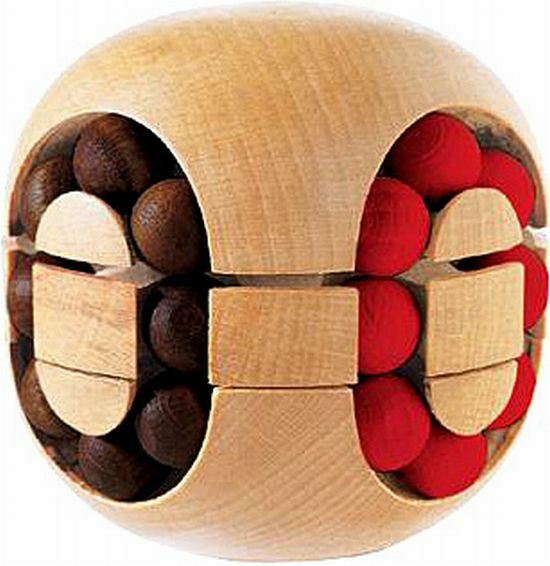 Now you do what you do so well with this 3D wooden sphere puzzle where you will have to move the same colored balls to one side on each of the four faces. A center ring will enable the ball displacement from one chamber to the next but we would have you know that each ball displaced reconfigures each chamber! Priced at $7.98, the game has just been kicked up a notch and if you can master this, all we can say is, Heil You!